In logistics rooms with high ceilings and high energy consumption costs, lighting plays a major role in workplace safety and energy efficiency. 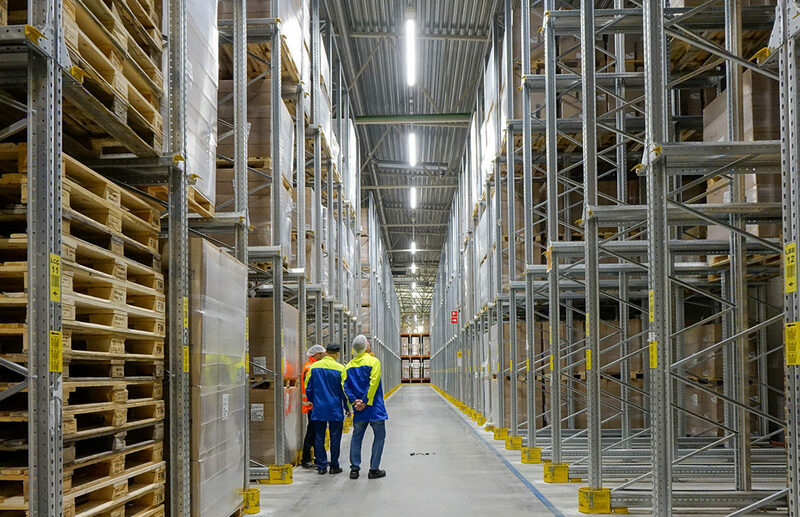 Read how Huhtamäki Foodservice Nordic achieved outstanding energy savings of 88 % and improved the working conditions of their logistics centre by investing in smart lighting. Huhtamäki is a global provider of food service packaging. The company is based in Espoo, Finland with 76 manufacturing units and 24 sales offices in 34 countries. Huhtamäki Foodservice Nordic has a plant and a logistics centre located in Hämeenlinna, Southern Finland. The logistics centre in Hämeenlinna is a large high-ceiling warehouse with several long aisles. In addition to the warehouse, the building has a separate loading area. In 2017, the light levels of the logistics rooms varied between 143 to 300 lux. Back then, the warehouse was lit with high-pressure sodium vapour lights and the loading area with fluorescent tubes. While there was enough light on some areas, the light levels were uneven and the lighting solution was not optimal to perform the work tasks on-site. Employees had trouble reading text and the lights caused some interfering glare. Moreover, uneven electrical loads were a challenge. Energy-efficiency-wise, there was room for improvement. With a lack of lighting control, the luminaires of the logistics rooms were constantly burning at full power. Ideally, the lighting is only on where and when lighting is needed. Greenled’s lighting solution for Huhtamäki Foodservice Nordic was a combination of smart lighting design, high-quality luminaires and adaptable lighting control. The high-pressure sodium vapour lights of the warehouse were replaced with Greenled’s Omega luminaires and all fluorescent tubes at the loading dock were replaced with Gamma luminaires. The light levels of both areas now reach the EU-standards and ensure sufficient lighting for the work tasks on-site. The optics of the luminaires were chosen to fit the high ceiling space with long aisles. Special attention was given to the vertical surfaces of the shelves, which are now much brighter while glare is kept at a minimum. From struggling to read text in an orange light, both forklift drivers and supervisors now report a significant change in the level and tone of the lighting. Image: The optics of the luminaires were chosen to fit the high ceiling warehouse with long aisles. Special attention was given to the vertical surfaces of the shelves, which are now much brighter while glare is kept at a minimum. Along with Greenled luminaires, the logistics rooms were equipped with motion detectors that automatically switch the lighting on and off to reduce energy use. With tens of aisles all varying in their usage rate, occupancy control significantly adds to the savings. At its best, occupancy control has brought added energy savings of 50 % in aisles with less traffic. Greenled also installed the OSRAM ENCELIUM™ light management system to cover the entire illuminated area. 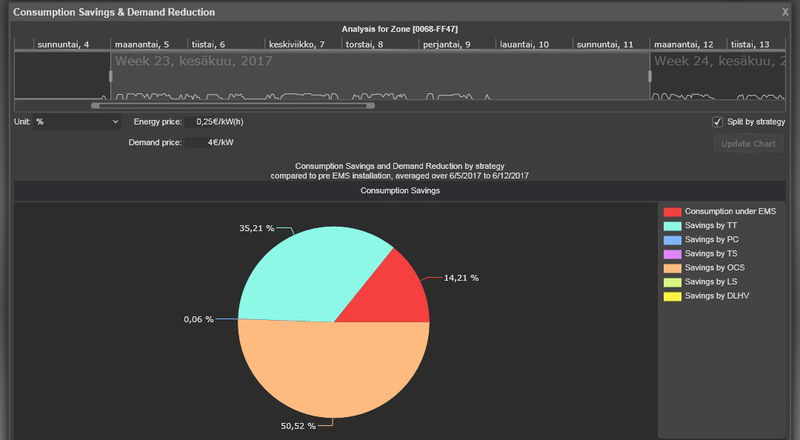 The customer chose the ENCELIUM™ system as it allows them to adjust the lighting through the interactive Polaris 3D software visual interface and see detailed reports of the energy consumption. The ENCELIUM system facilitates the commissioning, usage and data analysis of the lighting installation, and provides comprehensive control of the whole lighting system via remote access, including energy monitoring. Image: The reports of the ENCELIUM™ light management system demonstrate the significance of occupancy control. In this particular aisle with less traffic, the occupancy control (OCS) has brought added energy consumption savings of 50,52 %. Compared to the previous lighting, the new LED luminaires save the customer 66,15 % in energy costs. On top of that, occupancy control brought added savings of 21,98 %. All in all, Huhtamäki logistics centre in Hämeenlinna reached outstanding energy savings of 88,13 % with its new lighting solution. The whole lighting solution was provided as a turnkey service by Greenled, including planning, delivery, installation and commissioning. As a result, Huhtamäki Foodservice Nordic now has a sustainable lighting solution in their logistics rooms. The new solution saves them a lot of energy and more importantly, improves the workplace safety and comfort at the premises.